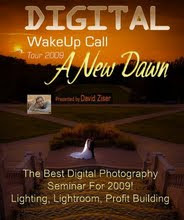 David Ziser's Digital WakeUp Call Tour 2009 was Wednesday night in Farmington and wow did we get our money's worth! He talked a thousand miles an hour, had an amazing amount of energy, had a corny sense of humor and gave tip after tip. This is a man who REALLY loves photographing weddings. David Ziser, an internationally-renowned wedding photographer, has shared his knowledge with tens of thousands of photographers in five languages and in 14 countries worldwide. Studio Photography acclaimed "Award winning photographer, David Ziser, is showing the world how to take wedding pictures." The Dallas Morning News extolled Ziser as "wedding photographer extraordinaire." David is one of 101 worldwide who hold the highest honor of "Fellow" bestowed by the American Society of Photographers. He also gave away lots of door prizes and I won a year subscription the the Digital Wedding Forum -- cool! We bought a zumbrella which we cannot wait to try out -- anyone want to get into their wedding dress and let us photograph you??? We would love to try out some of these new ideas and techniques that we heard about.